In October 2012, I travelled down to London to take part in the TUC rally against the Coalition Government’s austerity measures. I hadn’t attended a large London protest since the Stop the War rally on February 15th 2003 and smaller protests against the DSEi arms fair later that year. At that time, I was a member of the Sheffield Samba Band, which formed in 2001, partly in protest at the impending Iraq invasion, and which was part of the wider Rhythms of Resistance network. I joined the Band after attending another rally in London in 2002 and marching alongside them; I had loved the energy that the music lent to the protest, the way it seemed to galvanise people and kept up the momentum of the protesters. After a hiatus from active protest, I went on the London march last year and was somewhat surprised to see that samba appears to have been replaced with the monophonic honk of the vuvuzela. My husband and I travelled on a Unison-organised coach and marched with them As well as the usual placards and banners, Unison members were also handing out Unison-branded vuvuzelas, and it was noticeable that other trade unions had also mass produced these horns. As with many in the northern hemisphere, I had first came across these noisy horns during the World Cup of 2010, held in South Africa, in which many commentators remarked on the monotony of the noise in the stadia. Whether a goal had been scored or a referee had made a contentious decision, or someone had missed a penalty, the noise was the same – ‘bzzzzzzzzzzzzzzzz’. Indeed, such was the antagonism towards the instrument that sporting events such Wimbledon have since banned the use of the vuvuzela, as have venues such as Cardiff’s Millennium Stadium. From what I can ascertain, the first recorded use of vuvuzelas in a protest context in the UK was on July 13, 2010, when protesters with vuvuzelas converged on BP’s London headquarters to protest the company’s handling of the Deepwater Horizon oil spill. Later, activists protesting the proposed badger cull in the UK used vuvuzelas to drive badgers underground, away from the cullers. Both of these actions could be described as ‘spiky’, as opposed to ‘fluffy’ (more and less confrontational tactics in which the former advocates direct action and carefully planned chaos or ‘dis-organisation’), and what is interesting is the way in which the tools of ‘spiky’ actions are assimilated into more ‘fluffy’ actions, such as the TUC protest. Not having been in such close proximity to vuvezelas before, I was astonished by the noise they made when played en masse. It was very difficult to have any kind of conversation or to hear anything apart from vuvuzelas. More importantly for a political demonstration of this nature, repeated efforts by people with megaphones to instigate call and response chants in the crowd were drowned out by the horns. A chant would be started – for example, ‘you say cut back’ – with the response – ‘WE SAY FIGHT BACK!’ – but then, rather than being taken up and spread along the mass of people – ‘cut back’, ‘FIGHT BACK!’, etc. – the chant would die down almost immediately as it got lost under the multi-layered din of the vuvuzelas. A brass band marching only yards behind us was also drowned out by the sound and even the samba band was having difficulty cutting through the white noise of the vuvuzela ‘orchestra’. Whilst vuvuzelas are essentially horns and could be classed as musical instruments, it could be argued that they create not music, but noise. In the context of a political demonstration, the noise of the vuvuzela becomes part of the general cacophony of London, mimicking the honk of car horns in a gridlocked city rather than marking the protest out as something unusual and demanding of attention. My aversion to vuvuzelas as the new sound of protest, then, is that the sound is continuous, unstructured, monophonic, and discordant. 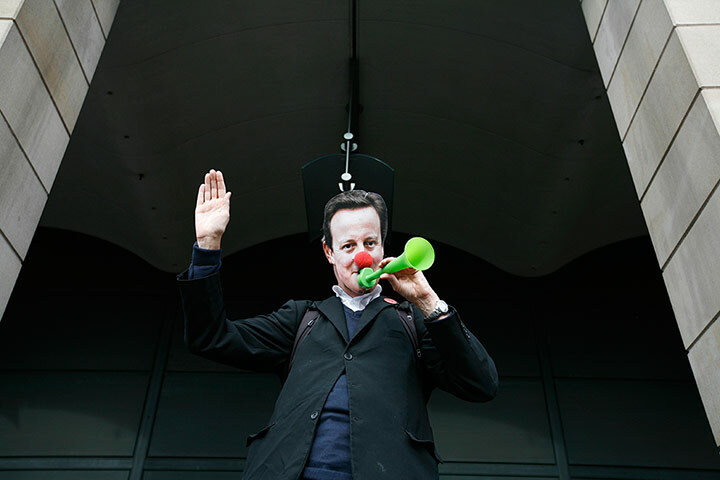 On the other hand, it could also be argued that vuvuzelas are the perfect instrument for a political protest: I would imagine that the vast majority of people who try it can play it; it makes a loud, satisfying noise; and it enables hundreds of people to ‘play’ together without any previous training or knowledge required. Unlike the small pockets of live music – whether samba, brass bands, singing, or portable sound systems – which create a hundred little separate protests, both united and separated by the music which marks out their section, vuvuzelas do ‘bond’ the entire demonstration, enabling the many thousands of people who have travelled hundreds of miles to participate, as one voice in one continuous stream from the front to the back in a collective gesture or display of disapproval. However, what is particularly fascinating about the sound of political protest is the melting pot of musical styles and traditions that make up the aural accompaniment to such demonstrations. In the 2012 London march, there were brass bands, samba bands, ceilidh groups, soundsystems, jazz groups, drummers, choirs such as the Liverpool Socialist Singers, and a variety of other little musical groups – some rehearsed, others impromptu. My worry about vuvuzelas is that they drown out this wonderful mix of styles, so that the only sound of political protest is ‘bzzzzzzzzzzzzzzzzzz’. If the 1990s were the ‘era of the soundsystem’ in political protests and the 2000s the ‘era of the samba band’, will the 2010s be remembered, then, as the ‘era of the vuvuzelas’? Finally, the day after the death of Margaret Thatcher, I was intrigued by the impromptu celebrations around the country, from public spaces to private homes. Via YouTube, I saw mobile phone footage from The Sheaf View pub in Sheffield, which showed the entire pub engaged in a singalong to ‘The Day Thatcher Dies’ by a local group from the 1980s called Don Valley & The Rotherhithes. There were also impromptu street parties in Brixton – reportedly featuring a sound system playing music from Thatcher’s reign – and Glasgow’s George Square – perhaps inspired by Mogwai’s song, ‘George Square Thatcher Death Party’ – featuring Martin Chomsky, the lead singer of Chomsky Allstars, singing ‘So Long Margaret Thatcher’. And what was the sound of protest in Glasgow? From various YouTube videos taken at the Glasgow party, I heard bagpipes, protest songs, communal chanting, and, yes, vuvuzelas. I had also always wanted to play samba since first hearing Paul Simon’s ‘Rhythm of the Saints’ (1990).